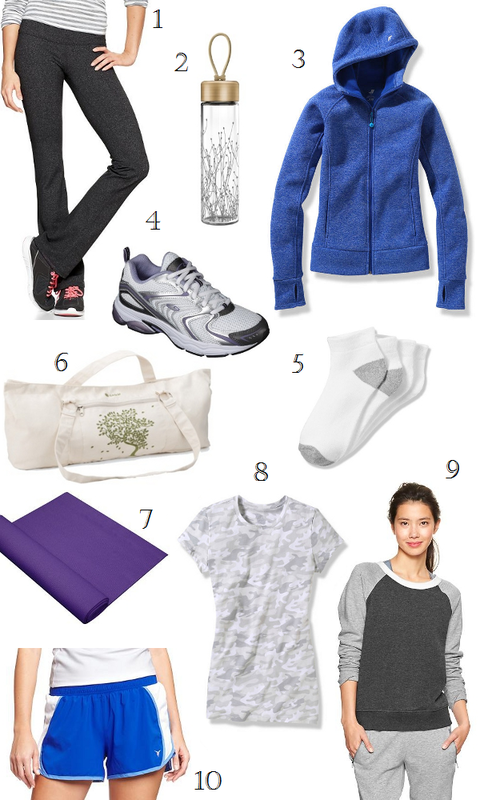 Now that holiday indulgences are past us, it's time to get back to a healthy routine. Admittedly, I'm pretty hit-and-miss with exercising regularly, but I'm hoping to change that this year as soon as my flu-induced fatigue wears off. Luckily, adorable yet affordable gear can be great motivation. 1. GapFit gDance heathered pants ($59.95). Most Vancouver women probably have a love-hate relationship with yoga pants, but you have to admit, they're very comfortable for exercise and lounging around. 2. Ello Thrive water bottle ($12.99 at Target). BPA-free, dishwasher-safe, with an easy-to-clean screw-off cap in wood. What more can you ask for? 3. Joe Fresh bonded zip jacket ($39). Keep warm while you warm up with a cozy hoodie. 4. C9 by Champion sneakers ($19.99 at Target). I don't recommend these for intense workouts or real running. But if you're like me and you just need a pair of comfortable, non-slip sneakers with good arch support for the elliptical, these are perfect. 5. Joe Fresh sport socks ($6 for a 4-pack). A good basic to stock up on. 6. Gaiam Tree of Life tote bag ($24.99 at Target). This lifesaver of a bag keeps your mat from unrolling to and from yoga or pilates classes. 7. CharterOak yoga sticky mat ($24.99 at Target). If you've resolved to take up yoga this year, buy a mat instead of renting one from the studio: so much more hygienic and more budget-friendly in the long run. 8. Joe Fresh camo print tee ($12). A gym staple—the cotton T-shirt—gets a fun revamp with a heathered camo print. 9. GapFit baseball sweatshirt ($38.95). So cute, you might be tempted to wear it with Converse, a peacoat, and skinny jeans on weekends. 10. Active by Old Navy side mesh running shorts ($8). I bought these after the first time I used our condo's poorly ventilated gym, wore long pants, and almost died. I've been using them ever since for my elliptical sessions and love them. That water bottle is gorgeous! I definitely find that I look forward to working out more when I have good clothes to wear :) Old Navy has some really reasonably priced options too. Yes! They have an activewear sale happening now—probably for all the New Year's resolutions people. yeah it's time for me to start going to the gym on a regular basis too! it was great seeing you the other day! Let's keep each other in check with the exercise resolutions!